Apple needs to make its iPhones bigger, Pinterest gets the most mobile traffic, Tumblr generates the most revenue, and people would rather share content within closed networks like Apple’s iMessage – all of those are some just of the latest trends in mobile, according to a new report from the Adobe Digital Index, part of Adobe Systems Inc. Released Monday, the report looked at mobile trends within the U.S. and tried to draw conclusions about what marketer should expect in mobile in the next little while – useful information to have, if they want to be relevant to their audiences. By looking at more than 10,000 consumer-facing websites and mobile apps of customers using Adobe Marketing Cloud, researchers managed to collect data from more than 18 billion visits and 700 million app launches. While that part of the research didn’t include any Canadian data, as part of their report, the authors also did some sentiment research, surveying more than 3,000 mobile users in the U.S., Canada, the U.K., France, and Germany. 1. If Apple wants to keep its hold on the mobile market, it needs to boost its iPhone screen sizes. With rumours swirling around a bigger iPhone during Apple’s launch event on Tuesday, this may not come as a really surprising finding. However, what’s clear is Apple is going to lose some of its web traffic with its Safari browser, unless it unveils some bigger phones soon, said Tamara Gaffney, principal analyst for the Adobe Digital Index. “More than half of all browsing on mobile devices, to the 10,000 U.S. websites [we researched], was on an Apple device, which is a very, very large percentage,” she said. However, she added Samsung has been launching a lot of bigger phones, some of which come with phablet-sized dimensions – that is, smartphones with screen sizes approaching ones that are typically found in tablets. “When we looked at screen size, we saw the increase in the largest devices to be 132 per cent year over year, whereas the iPhone 5 is down 11 per cent year over year,” she said, adding tablet browsing is actually decreasing – most likely because consumers are turning to their bigger phones to check out sites on the web. Still, it’s not as though Apple is going to lose its dominion any time soon. While Chrome’s market share has gone up 5.7 per cent, stealing some of that from Apple’s Safari and Android Browser, Safari still drives more traffic than both of those browsers combined. Plus, the Apple iPhone still drives 54 per cent of U.S. smartphone traffic, while the iPad is at 80 per cent among tablets. 2. You might have thought Facebook would drive the most mobile traffic among social platforms – but you’d be wrong. 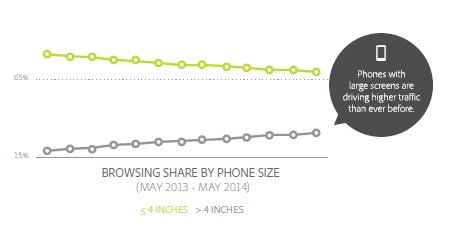 The most referred traffic among mobile browsers actually comes from Pinterest. Plus, Tumblr is actually the most likely to get marketers some bang for their buck, if they have products and services that fit its audience. About 64 per cent of Pinterest’s referred traffic is drawn from mobile browsers, while Facebook’s hovers slightly above the 50 per cent mark. This is important for marketers, as a hefty 36 per cent of social referred visits to online retailers are through mobile devices like smartphones and tablets. What’s also interesting is Tumblr’s status as a potential money maker. 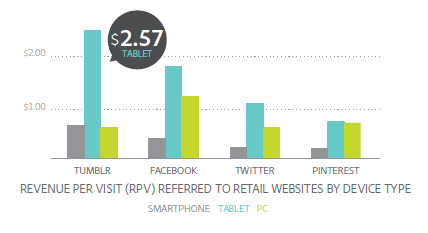 A visit to Tumblr from a tablet user is actually worth $2.57, miles ahead from Facebook, Twitter, and Pinterest. That means the social network actually generates the highest revenue per visit via mobile devices – a finding that actually surprised Gaffney and her team. And while she didn’t know exactly why Tumblr was so attractive, she had some theories. “What we’re seeing with this Tumblr thing is that the potential is, the demographic profile of Tumblr [users], although they’re small, they’re mighty. It might be because they’re big mobile shoppers, and it might be because they have more disposable income,” she said. 3. When it comes to sharing content online, people seem to prefer to do it in group sharing contexts, like iMessage, rather than very public social forums like Facebook. For sharing content online, Apple’s iMessage is up 259 per cent, while email is up by a small 5.2 per cent. By contrast, Facebook is down 42.6 per cent, though Pinterest is up 131 per cent. None of this means marketers need to stop using Facebook or other, more open networks to reach their audiences, as people are still on those platforms, Gaffney said. What it may mean, though, is that people are less likely to share generically and may want to keep their sharing within the contexts of smaller, more close-knit relationships. Nor does Facebook seem to be unaware of this trend, judging by its acquisition of WhatsApp, a more closed messaging service, in February for $19 billion.